Brandon over at ThatGreenDude posted something the other day about the sadly lost art form that is the video game instruction manual. I really miss manuals. There was something really cool about buying a new game and getting to learn all about it, becoming comfortable and confident and immersed in it before you even started playing for the first time! I always quite liked the reassurance, too, of having a sort of quick-reference guide available in case I forgot how to do something at a critical moment. Sadly, manuals aren’t really much of a thing any more. These days we tend to have tutorials within the games themselves, which can have both positives and negatives (as can any thing that can be done well or not-so-well, of course). For a bit of further reading on that topic, here’s a great article I came across while doing some thinking about this, in which a few potential ways to make an in-game tutorial not only palatable but an enjoyable part of the experience are discussed smartly. It occurred to me that there are some really great games which teach players things in super-awesome ways that deserved to be mentioned, so… let’s do that, huh? Just a short one today, as I’m more curious to hear more thoughts on this from you guys rather than ramble! It’s no secret that Mario games are really good at introducing the player to new things, but let’s talk about it anyway. The genius of it is that each time a new element is introduced, the player is encouraged by the environment to discover for themselves how it works in a safe way before having to make use of it under pressure. The classic, iconic World 1-1, for example (you know the one; some version of it’s appeared in almost every 2D Super Mario), includes within the first few moments several blocks, an obstacle over which to jump, and an enemy upon which to stomp. There’s a whole Wikipedia article just on this level, in fact; the player is quickly encouraged to work out what yields benefits and what gets them killed without losing much progress at all, meaning that they can now recognise these things in a more challenging setting later on. This is only a single example from Mario, though; think of the first time you get the cape in Super Mario World, when the game immediately presents you with a large open space in which you’re almost certain to discover how to fly seemingly by accident! (This was brought up, in fact, on an excellent recent episode of Mage Cast, the Well-Red Mage podcast.) It’s another example of letting you work something out for yourself safely, so that you now have that tool at your disposal when you need it. 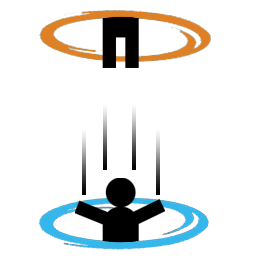 Portal is perhaps the ultimate tutorial; throughout the entire game (which is, admittedly, not that long), you never stop learning! It’s basically one long continuous introduction to new mechanics, revolving through endless cycles of giving you one new tool in isolation, letting you play around with it for a bit, then combining your new knowledge with all the things you already know how to do to create new, challenging (but always coherent and sensible – the effects of using two things in tandem will never be unpredictable) puzzles to be solved in ever more complex ways. I’m currently playing Chrono Trigger (on my phone, if you can believe such a thing) for what isn’t quite the first-ever time but is the first time in a rather long time and I don’t really remember any of it from the first time round. Not even sure how far I got! Anyway, Chrono Trigger doesn’t really have any explicit ‘how to do stuff’ things in any form: there’s no in-game tutorial, as far as I can tell, and at least in this iOS version there’s no manual, so I’ve just had to learn all the mechanics as I go. I’ve been impressed with how easy it’s been to understand exactly how everything in the combat and so on works without ever actually being told what to do, but that’s not the coolest learning moment I’ve had in Chrono Trigger. At the very beginning of the game, you start out controlling Crono as he wanders around a fair. There are plenty of things to do, including items to pick up and merchants to talk to, and you’ll probably play this in a fairly standard RPG fashion, picking up everything you can get your hands on and trying to buy and sell and whatnot. 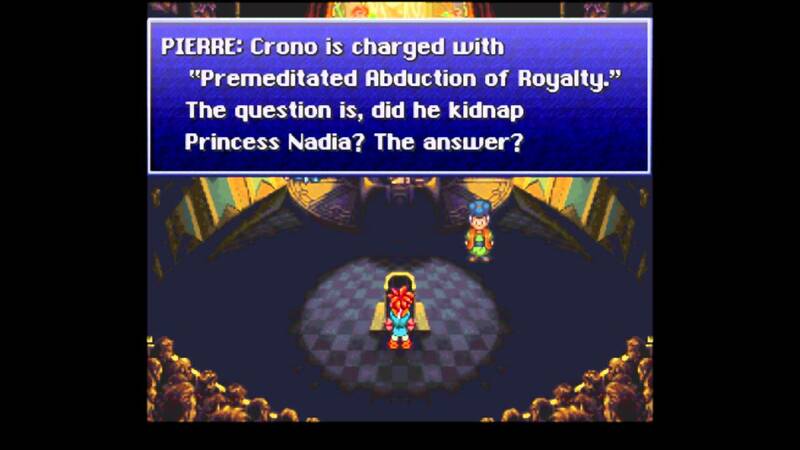 Not long after, you find yourself accused of kidnapping Princess Nadia, who in the guise of a girl named Marle encountered and joined up with Crono at the fair before disappearing. At the trial, everything you did at the very beginning will come back to haunt you. If you took an old man’s lunch, which was just hanging out and was easily picked up, that’s used as evidence of your bad character. If you didn’t help a young girl find her lost cat, you’re selfish. If you looked at Marle’s dropped pendant before making sure she was OK, then you’re clearly in it for the money and not for friendly reasons – and heaven help you if you tried to hawk the pendant to the merchant. I did all of these things wrong, and it was so cool. I actually have no idea whether Chrono Trigger will have any more moments like this, but I see the potential for this to be a really awesome learning method; I now know that my actions will have consequences, so I need to think about the actual meaning of everything I’m doing rather than following standard RPG trope behaviour. This first instance didn’t cost me much, since I quickly escaped the prison they threw me into, but there could be future moments which will punish me much more harshly, and this time I won’t be as blindsided and have only myself to blame for doing something dumb when I really ought to have known better. So those are some recent examples of really cool teaching-y thingies, and it might also prompt thoughts about how games can be actual teaching tools – as in, they can teach not only about their own mechanics and workings but about other things too. That’s a bigger, separate topic, though! There must be other games that have awesome moments like these, so let me know some of your favourites! I think there are good and bad ‘noob caves’, but it can be done well if you feel like you really are learning the ropes effectively enough to be able to use them when you get out. Like you say, it makes you feel prepared and raring to go! Very easy to fall into boredom that way, though.